In an era of tight residential care margins, managing occupancy well has never been so important. Whether or not your homes have availability, having a handle on your care home occupancy position is thus integral to your business performance. CoolCare is designed to boost your occupancy and maximise revenues. By monitoring occupancy levels, simplifying accurate invoicing and assisting to convert those all important enquiries, CoolCare soon pays for itself. We know that the initial enquiry from a family member can be the toughest call they’ll make, so how they are dealt with at this point is hugely important. CoolCare4 allows you to manage your potential customers sensitively. Being able to support their needs shows that you care. If you care for their enquiry, then they know you’ll care for their loved one. Our inbuilt specialist CRM system is designed to support your staff to look after their enquiries and waiting lists. It enables easy oversight and KPI monitoring so management teams can keep a track on lead generation and conversion rates. Utilising the four key milestones of any enquiry journey in our CRM, teams create a “To Do” list and monitor the progress of each enquiry, to ensure they are being given the attention they deserve. Your relationship with your customer is everything. A customer is more than one person – it is the resident and their family. CoolCare4 helps you manage your customer relationships from initial enquiry through to conversion into a resident. Waiting lists are automatically updated. You can convert an enquiry to a resident at the click of a button. Track your enquiries progress through the key milestones of an enquiry customer journey. Make notes of the initial enquiry; assign tasks to yourself or others; record those important details about the prospective residents likes. Keep up to date with what others have done to progress the enquiry. Having this information at your fingertips therefore helps you build trust and reliability. All of which we know are important in care home management. Who doesn’t need a To Do List?! You can transfer all those bits of paper into one place and check it daily. Keeping up to date on looking after your enquiries is so straightforward. You know exactly what your priorities are and who you need to contact. Managers spend less time chasing up actions as they can see which actions are planned by whom and when. Knowing who’s living in your home at any one time is core to care home management. It affects the type of care you need to deliver, the staff you need to roster and is fundamental to the performance of your business. Occupancy directly affects your invoicing and therefore your income. 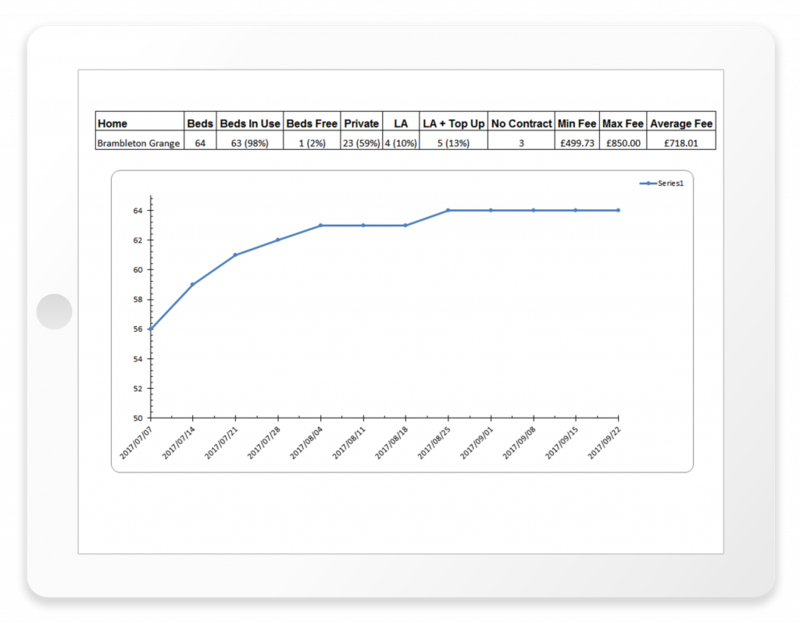 Quickly being able to analyse your mix of permanency, dependency and funding types allows you to plan effectively. You can analyse and manage all of this on CoolCare4. That means you can cater for eventualities and manage your business well. 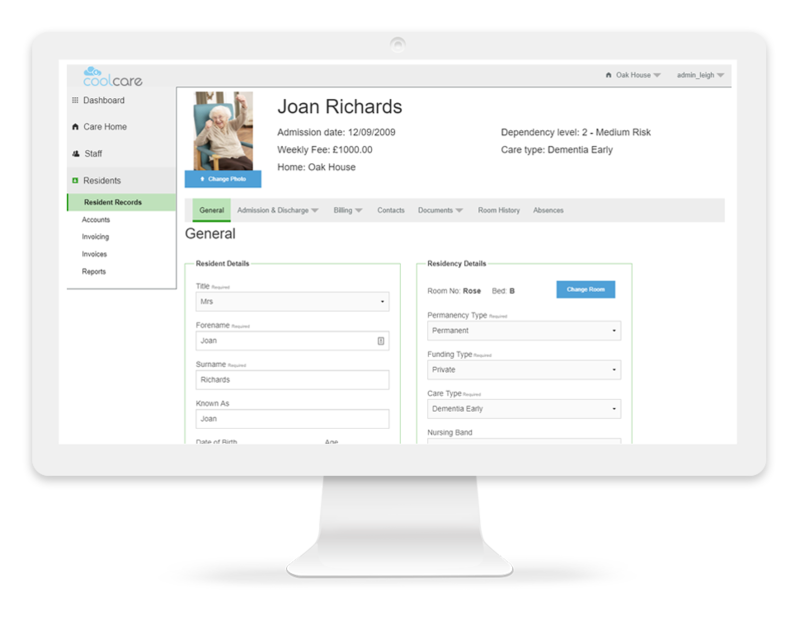 CoolCare4’s Resident Records will provide you with key information about your residents in one place so you can view it at a glance. You will be able to see a resident’s dependency level, how they are funded, their weekly fee, NHS number, next of kin and much more. Records are quick and simple to update so you can swiftly record any changes to funding arrangements. Absences affect invoicing and income. Here you can log planned and unplanned absences, keeping track of any staff accompaniments. Absences link directly to billing so fees will reduce automatically based on the rules you have set. You’ll be pleased to know that CoolCare4 is GDPR-friendly. We did the hard work, so you don’t have to. Residents’ contact details are kept in just one place and you decide who has access to them. Against each contact type you can record whether they are happy to be added to any marketing lists you hold. Keeping accurate records on who was living in which room and when, means you can invoice accordingly from start to finish. Returning residents may require the same room each time– you can check where they stayed before and see if its available for their latest stay. Even if you are unable to cater for their preferences, you can positively communicate this to show you understand your customers’ needs. Care homes amass a lot of paper. Each resident has oodles of files relating to care, finance and everything and anything else you can imagine. You can upload as many documents as you like. That makes it super helpful when Head Office need a document relating to a resident held at home level. Just upload it to the resident records and hey-presto, Head Office can review it. It’s a big help for contract management. Occupancy management is the life blood behind the home. It pays your wages and gives you funds for capital expenditure. Perhaps a new garden room for your residents to enjoy in Summer or a wage increase for your hardworking team? Clearly, care has to be right. No amount of management reporting will create a desirable place to live. Occupancy is, however, a useful indicator of where you need to focus your attention. Why isn’t that home getting many enquiries? We are getting a lot of discharges moving to other care facilities – why is that? Or even better, this home is always full, has a waiting list and keeps residents for over two years on average – what is their secret formula? See your live care home occupancy information as soon as you log-in to CoolCare4. Whether viewing at home or group level, you get a snapshot of your overall performance, split by funding types in a simple pie-chart. Analyse the mix of residents you have at your home. See what your average occupancy is. Monitor how that is affecting your average fee rates. A fantastic tool for setting KPIs and measuring performance against it, spotting any anomalies and rectifying efficiently. Each enquiry is a potential resident. They could be over £30,000 of revenue for your business. How they are looked after and converted is central to good occupancy performance. A marketing manager’s dream, CoolCare4’s enquiry reporting will enable easy checks against KPIs; identify marketing need; and produce metrics for forecasting. Keep a track of who is moving in and out of your homes. Are they the type of residents your projections had been expecting? There is a lot of administrative work to be undertaken when a resident moves in. Missing fees and contracts are a perennial problem in a care home business. Checking your admissions and discharges will identify any missing contract or fee information.